I've always wanted try making Stained Glass Cookies. Stained Glass Cookies? They are cookies with brightly colored see-through hard candy in the middle. If you poke a hole through one side of them, you can actually hang them as Christmas decorations. The cookies themselves are flavored with ginger, nutmeg, and vanilla, and contain cream cheese. The dough requires an overnight chill, and is pretty easy to handle. 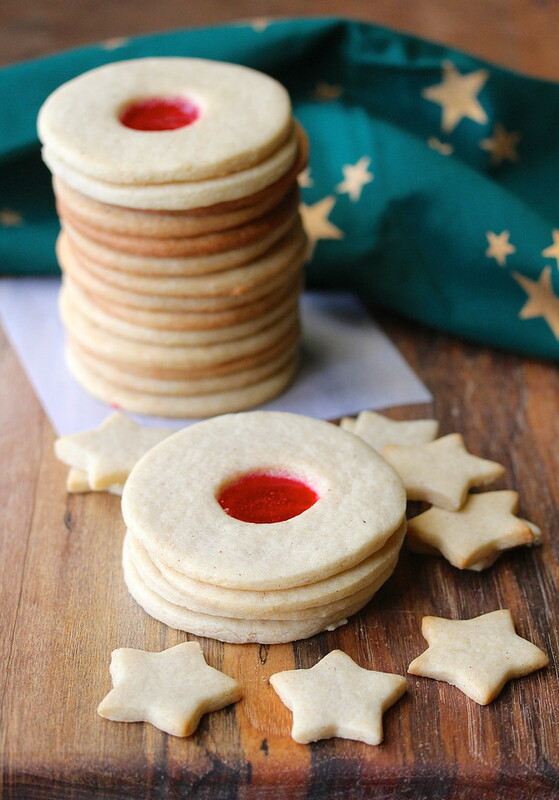 I made a few stars with some of the leftover scraps, and they cooked in the same amount of time as the filled cookies. I'd actually recommend this dough for making decorated cookies. Let's talk about the hard candy center. Because I love you, my readers, I will not lie to you. Getting this right was not easy. The cookies are filled with melted Jolly Rancher candies, and perfecting the amount and size of the candy took some trial and error. I highly recommend experimenting with a few cookies until you find what works for you. At first I pulverized some of my candies in the food processor, which resulted in the candy cooking faster than the cookies, and bubbling up over the sides of the cut out center. After breaking the candies into bigger chunks, the candies melted and flooded the center without bubbling over. Next time I might actually try just sticking the whole candy in the center and let it melt. I also don't recommend trying to cut fancy shapes into the center. The leavening will cause the shapes to get weird. Trust me. I would recommend using a shaped cutter of your choice for the outside though. I'm sure that would be fine (see my little stars!). Making these cookies can be a bit fussy, but they are pretty fun when you finally get it right. I'll definitely be experimenting with them again now that I've got this batch under my (literal) belt. Regarding the candy, I understand Lifesavers work too. Regarding the Jolly Ranchers, the cherry ones looked much better than the watermelon ones, which came out pretty pale. The blue, purple, and green Jolly Ranchers were fine too. My advice? Experiment. Try different ways to use the candy. Use different sizes of cookie cutters. Have fun with these! In the bowl of a stand mixer, mix the shortening, butter, and sugar on medium speed until fluffy. Add the cream cheese, vanilla, and egg, and mix until well mixed. In a medium bowl, whisk together the flour, ginger, nutmeg, baking soda, and salt. Add it, in stages, to the mixer and mix on low until just incorporated. Mix with a spatula until all of the dry ingredients are incorporated. Divide the dough into 5 equal pieces and wrap each with plastic wrap. Refrigerate overnight. In plastic bags, lightly break up the candies by color and place each color in a bowl. Remove one of the pieces of dough from the refrigerator and roll it out between two pieces of wax or parchment paper with a rolling pin to 1/8 inch thickness. 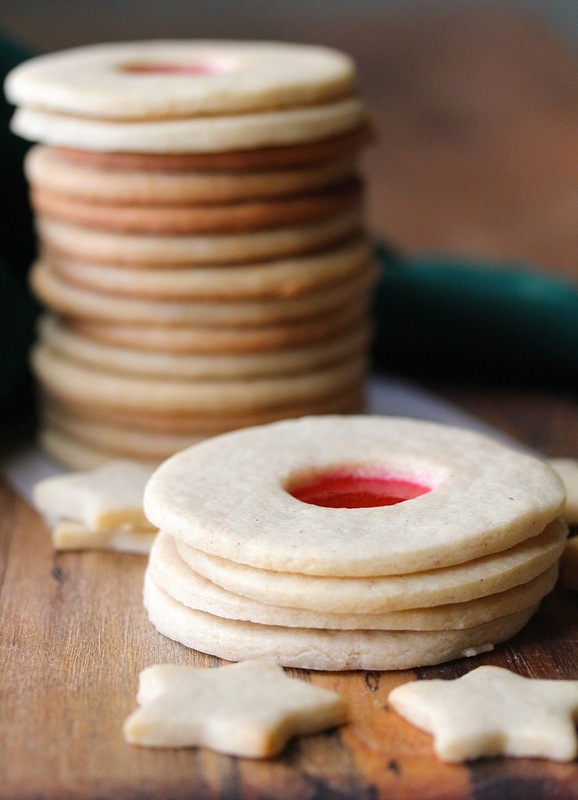 Cut the dough with a 3 inch round cutter (or whatever type of cutter you'd like). Cut out the center with a 1 inch round circle. Move the dough to the baking sheet. Mound the candy in the middle of the cut out circle. Place the baking sheet in the oven, and bake for 8 minutes. Cool the cookies on the pan. Carefully remove them with a spatula when cooled. 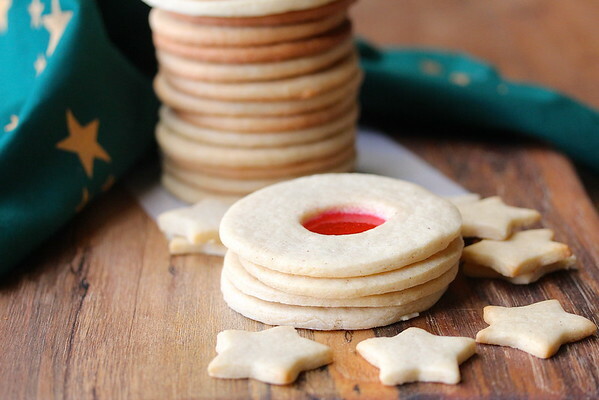 Store the cookies between layers of wax or parchment paper in an airtight container. Hi Karen, I have never seen these kind of cookies before, they are beautiful! Thank you Cheri! Kids love the candy in the middle. The boys loved eating the leftover candies! I have always wondered how people make these cookies. They are beautiful. Thanks for the candy melting tips! It was definitely trial and error Betsy! For the holidays I love to make pralines. I just love these cookies!! So beautiful! Thank you for sharing your melting tips!! These cookies are just beautiful! The kind of thing where you have to write down all your Lessons Learned in an After Action Report so you can skip all the experimentation the following year and just be known for being a Stained Glass Cookie RockStar! I'd love to see these on a holiday cookie plate! Oooh! Stained Glass Cookie RockStar. I like how that sounds! These are so beautiful! 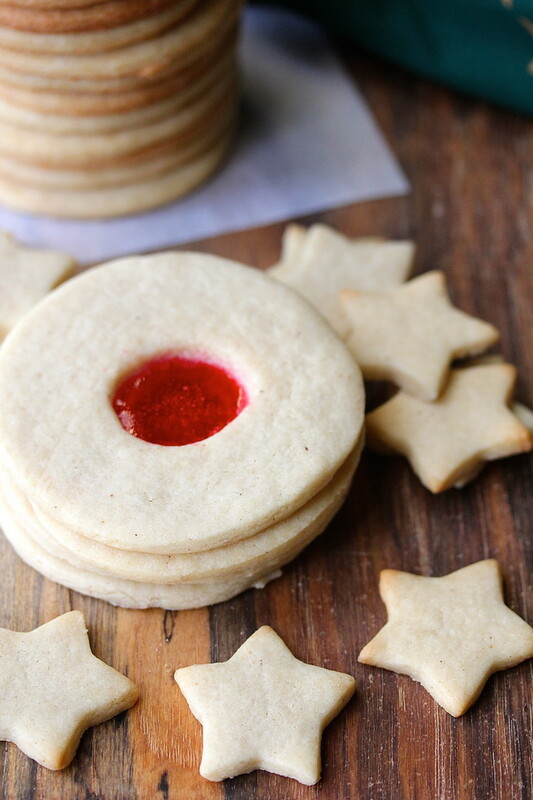 Perfect holiday cookies! These are gorgeous! Every year, I swear to myself that I am going to make a gingerbread house with stain glass windows but, I run out of time. I guess I thought it would be difficult. Your directions look super easy to follow. No excuses for next year now! Thanks Sandra! That sounds so fun. Thanks Kim. Thanks for all of your hard work. Just beautiful, in the same way that I cathedral with stained glass is beautiful. I don't think I could eat one of these, I'd be too busy staring at it.